Gaston Ramirez joined Southampton from Bologna for £12m in 2012. Hull have signed Gaston Ramirez on loan from Southampton and Mohamed Diame from West Ham for an undisclosed fee. Diame, 27, has signed a three-year contract with the Tigers, while Ramirez, 23, will spend the season at the KC Stadium. The midfield pair follow the arrival of striker Abel Hernandez, who signed on deadline day for £10m from Palermo. Hull also added 27-year-old France winger Hatem Ben Arfa on loan from Newcastle. They have also sold forward George Boyd to Premier League rivals Burnley for £3m. Ramirez, who has 31 caps for Uruguay, joined Southampton from Bologna for £12m in 2012. 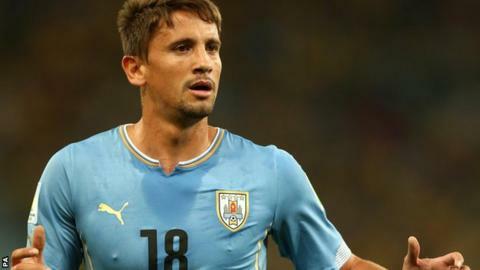 A Southampton statement said: "With Ramirez keen for regular first-team football, something has been further limited by recent attacking additions to the squad, the Uruguayan has been allowed to join the Tigers on a temporary basis." Ramirez will not be allowed to face his parent club in the Premier League. Senegal international Diame scored seven goals in 76 appearances for the Hammers after joining from Wigan two years ago. "I'm delighted to welcome Mo to the club," said Hull boss Steve Bruce. "His experience, both at international level and in the Premier League will be invaluable as we look to cement our place in the top flight." Diame, who reportedly has a £3.5m buyout clause in his contract, has been allowed to leave Upton Park after manager Sam Allardyce made eight summer signings, including fellow midfielder Alex Song on loan.